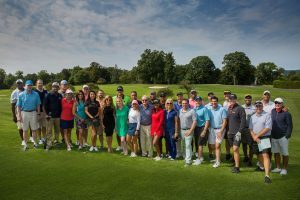 The Broadcasters Foundation of America raised $250,000 to help broadcasters in need during its Celebrity Golf Tournament last week at the Sleepy Hollow Country Club in Briarcliff Manor, NY. The annual event is one of the Broadcasters Foundation’s biggest fundraisers. This year, more than 150 broadcasters and celebrities came out in support of their colleagues, many of whom have experienced personal devastation and loss from Hurricanes Harvey and Irma. The Foundation has already distributed $50,000 in emergency aid to 50 broadcasters impacted by Hurricane Harvey. That number is rising quickly, and is expected to double over the next few weeks. Another $100,000 in emergency grants is projected to be awarded in response to damage from Hurricane Irma. Among the many celebrity golfers were: Bruce Beck, WNBC-TV; Tina Cervasio, CBS Sports; Rachel Grant, actress and philanthropist; Jay Harris, ESPN; Otis Livingston, WCBS-TV; Karl Nelson, NY Giants; Lee Saltz, New England Patriots; Bill Smitrovich, film & television actor; John Starks, NY Knicks; Bob Wischusen, voice of the New York Jets, and more. Event Chair for 2017 was Leo MacCourtney, President and Chief Executive Officer of Katz Television Group. Sponsors included: title sponsor Evercore Wealth Management, ABC Channel 7, CBS Television, CBS Radio, NBC-Owned TV Stations & Telemundo Station Group, Eileen & Jack Connors, Jr., ESPN Radio, Empire Merchants, Flexjet, Norman Knight Charitable Foundation, Marketron, Nielsen, Putnam Investments, Tito’s Handmade Vodka, and others. The Lee Iacocca Villa Nicola in Tuscany, which was donated by Ned and Kate Hentz, pulled in an additional $27,000 in auction.